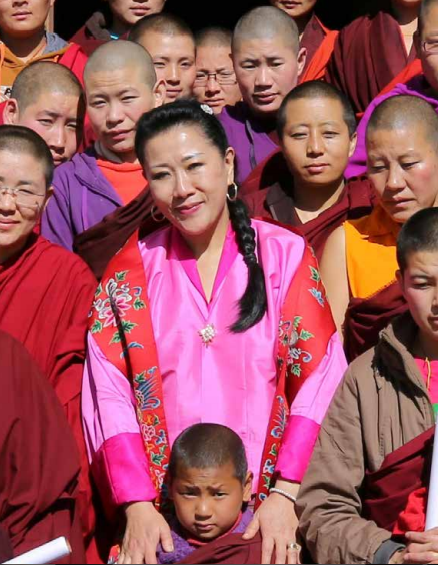 Dr. Tashi Zangmo is the Director of Bhutan Nuns’ Foundation, a non-profit organization established in 2006. The foundation works diligently to improve the well-being and education of nuns in Bhutan and enable them to contribute to the cultural and spiritual values of the larger society. We met Dr. Tashi at the construction site of a new training centre being developed especially for the training and development of nuns acorss Bhutan so that they may be better able to integrate their service in society. We took a tour of the building being built with Dr. Tashi who excitedly informed us that all of the construction was being done by donation, and each part of the building – the roof, the floor, the steps were donated by different donors. She spoke to us at length about the use of local labor, construction methods, and so much more. On the construction site was a 15 century Buddha temple, it seemed especially right for this unique temple filled with incredible soft and compassionate energies to be in the training centre for nuns. As our conversation continued Dr. Tashi spoke about her life, her passion for education and share her motto – Education is Liberation. Not surprising considering she was the first girl child sent to school from her village. She attended the only school in Wamrong, which was quite a distance from her village till the sixth grade and then came to Thimphu. 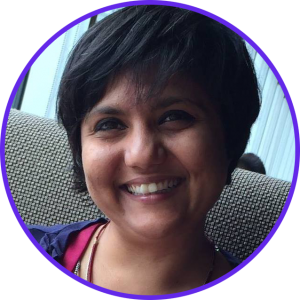 She went to school in Thimphu and soon went to the Centre for Higher Tibetan Studies (CHTS) in Varanasi, India. She was informed that the CHTS in Varanasi, started accepting women applicants other than monks and laymen and she saw this as an opportunity to have a deeper understanding of Buddhism and to set her on a path of learning and research. 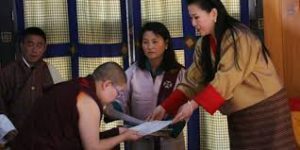 She was the third batch of women inducted into the course and again she was the first woman to go from Bhutan. That was when she really started helping nuns in her village and realizing that she could do so much to support nuns. After she graduated from CHTS, Varanasi with a BA Degree in Buddhist Philosophy in 1995, she had the opportunity to go to the United States to study at one of the first Women’s college (Mount Holyoke College) in the US and earned her second BA Degree in Developmental Studies in 1999. Then she continued here higher education in the US and received her Master Degree and PhD from the University of Massachusetts, Amherst. Upon her return she set up the Bhutan Nuns Foundation (BNF) under the patronage of Her Majesty the Queen Mother Ashi Tshering Yangdon Wangchuck, third wife of the fourth Druk Gyalpo (king) of Bhutan. Over the past six years, the foundation has worked hard to reach out to the nuns and nunneries across the country. They have provided trainings and seminars that have enabled the nuns to realize their full potential. Beyond engaging in just their spiritual practice, they are encouraged to reach out to their communities and become more socially responsible individuals. Since nuns by nature are caring and nurturing, our Centre will enable them to become the counselors, caregivers and spiritual guides that every society needs. They can be particularly beneficial to the younger generation who seek advice and guidance. Providing training on Life Skills Education (LSE) to nuns and nunneries throughout the country is an area in which BNF has been working closely with UNFPA Bhutan since 2011. Their goal for this initiative was to recruit, educate and train nuns to increase their capacities, and encourage them to build networks among women in their localities as well as between nunneries. In particular, these training courses seek to raise awareness on critical topics such as women’s reproductive health, HIV/Aids and other kinds of related communicable and non-communicable diseases. BNF’s wish is to train nuns so that they in turn become agents for change and pass on the message to other women in rural villages. 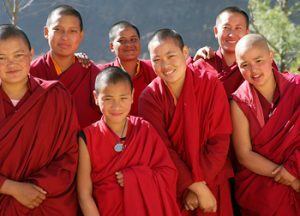 In most villages in Bhutan people go first to the nearest monastery or temple to seek help and have the monks or nuns say a prayer when they are sick rather than going to hospitals. Therefore, educating the nuns in the areas of health, sanitation and nutrition is most critical as they can impart this knowledge to their community. An additional, important field of training and instruction is the care and support of elderly people in the community. We offered Dr. Tashi important tools for serving the beloved nuns of Bhutan with love peace harmony cd, Love Peace Harmony chanting and forgiveness practice translated in Dzongkha, the official language of Bhutan and Tao Calligraphy of Da Ai – the greatest love. Dr. Tashi expressed her hopes of having some of our Master teachers teach courses of self-healing and calligraphy at the new BNF centre for learning and resources in the future.